(NaturalNews) While the mainstream media is busy making a mockery of itself with runaway hysteria "witch hunt" hate speech against parents who choose not to poison their children with toxic vaccines, the real story on the measles outbreak remains entirely unreported in any mainstream media outlet. What story is that? The true story about how Big Pharma's own vaccine scientists blew the whistle on MMR vaccine research fraud taking place over a decade ago, warning that the vaccine's approval by the FDA was based on "falsified results" and that the fraudulent MMR vaccine was the "primary cause" of a measles outbreak in 2006, as they state in their own words (see below). The senior management of the world's top vaccine producer was actively engaged in the fraud, according to the whistleblowers, even going so far as to test the vaccine against contrived "laboratory" strains of infectious viruses rather than testing them against strains circulating in the real world. 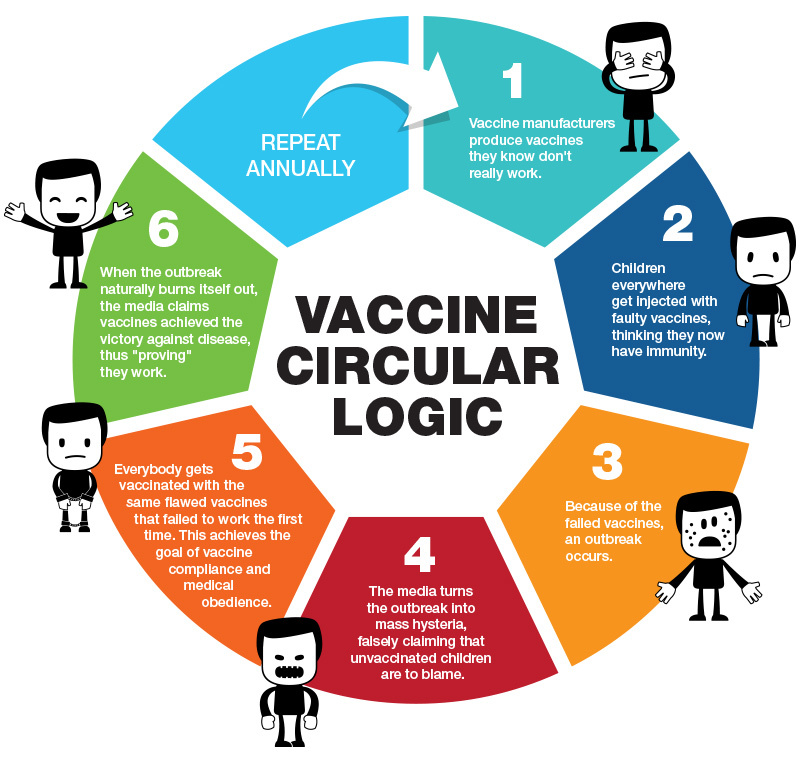 This created an MMR vaccine with results that could be faked to appear effective while actually conferring almost no real-world protection at all, thereby ensuring an eventual outbreak that the media would seize upon to call for more vaccines. We now have new transcriptions from this document filed with the United States government, which reveals shocking details about the vaccine fraud witnessed firsthand by Big Pharma's own scientists. 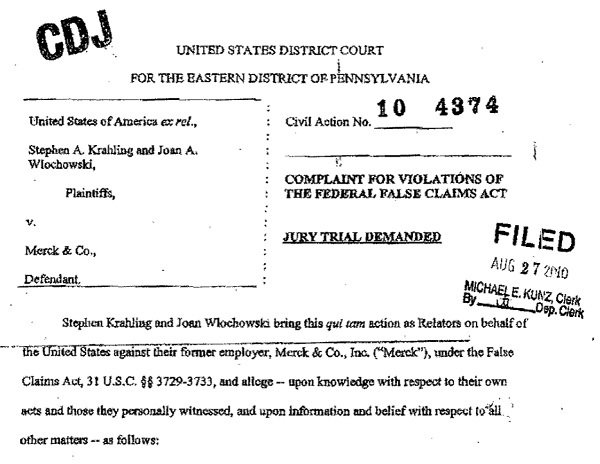 The document is entitled United States District Court for the Eastern District of Pennsylvania. Civil action No. 10-4374. "Complaint for Violations of the Federal False Claims Act." While Merck's PRN test was modeled after the efficacy test generally accepted in the industry, it diverged from this "gold standard" test in a significant way. It did not test the vaccine for its ability to protect against a "wild-type" mumps virus. A wild-type virus is a strain of the virus as it exists in nature and would confront a person in the real world. That is the type of real-life virus against which vaccines are generally tested. Instead, Merck tested the children's blood for its capacity to neutralise the same Jeryl Lynn mumps strain with which the children were vaccinated. The children's vaccine response was not tested for its capacity to neutralize virulent, disease-causing mumps virus. 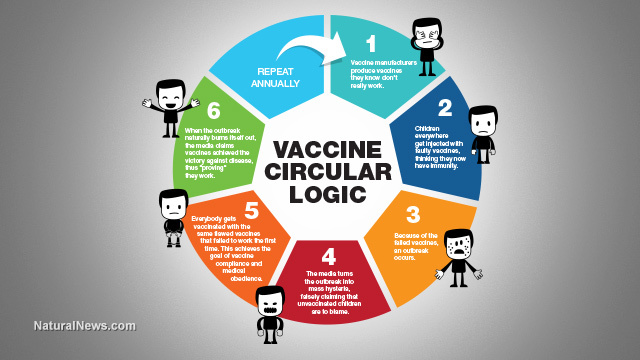 The use of the Jeryl Lynn strain, as opposed to a virulent wild-type strain, subverted the fundamental purpose of the PRN test which was to measure the vaccine's ability to provide protection against a disease-causing mumps virus that a child would actually face in real life. The end result of this deviation from foe accepted PRN gold standard test was that Merck's test overstated thee vaccine's effectiveness. The second test Merck employed under Protocol 007 was formally called the Anti-IgQ Enhanced Mumps Plaque Reduction Neutralization Assay. It was commenced in 2000 and again led by Krah and hia staff at Merck's West Point facility. Relators Krahling and Wlochowski participated on the team that conducted this supposedly enhanced test. Each of them witnessed firsthand the falsification of the test data in which Merck engaged to reach its 95 percent efficacy threshold. In fact, each was significantly pressured by Krah and other senior Merck personnel to participate in this fraud. But the use of the rabbit antibodies allowed Merck to achieve its high seroconversion objectives. In fact, the exact same paired blood samples that were found under Merck's original PRN test to lack sufficient virus neutralizing antibodies were now considered seroconverted under the "enhanced" test. Indeed, in one panel of sixty paired blood samples that had failed the original PRN test, Merck measured a seroconversion rate of 100 percent! ln other words, non-neutralizing concentrations of antibodies that would never protect a child from mumps in the real world were under Merck's "enhanced" test treated as vaccine successful solely because of the additional neutralization provided by the rabbit antibodies. Specifically, Krah and Yagodich and other members of Krah's staff falsified the test results to ensure a pre-positive neutralization rate of below 10 percent. They did this by fabricating their plaque counts on the pre-vaccination blood samples, counting plaques that were not actually there. With these inflated plaque counts, Merck was able to count as pre-negative those blood samples that would have otherwise been counted as pre-positive because of the increased neutralization caused by the rabbit antibodies. Unsurprisingly, none of the "recounting" and "retesting" that Merck performed as part of its "enhanced' PRN testing was performed on any post-vaccination samples or on any pro-vaccination samples that were pre-negative. This additional "rigor" was only applied to the pre-positive samples, the very samples that were keeping Merck from achieving the requisite 95 percent seroconversion threshold. In July 2001, Relators Krahling and Wlochowski conducted their own test to confirm statistically what they already knew to be true. They reviewed approximately 20 percent of the data that Merck had collected as part of the "enhanced" PRN test. In this sampling, they found that 45 percent of the pre-positive data had been altered to make it pre-negative. No pre-negatives were changed to pre-positives. No post-positives were changed to post-negatives. No post-negatives were changed to post-positives. All changes were in one direction - reducing the incidence of pre-positives. The statistical probability of so many innocent changes occurring in just the pre-positive data and in no other data was more than a trillion to one. And that is a conservative measure given the likelihood that an even greater number of pre-positives were changed but remained undetected because the changes were not recorded in Merck's files. "Acted with the authority and approval of Merck's senior management"
In July 2001, Relator Krahling met with Alan Shaw, Merck's Executive Director of Vaccine Research, and complained to him about the fraudulent vaccine testing. Krahling presumed that Shaw already knew about the fraud since he visited Krah's lab frequently and almost certainly would have witnessed the changing of pre-positive data that Krah was openly directing. Nevertheless, Krahling wanted to put Shaw on formal notice of the fraud end told him of the falsification of the pre-positive data. He also complained about the improper use of the rabbit antibodies to inflate the post-vaccine neutralization counts. Shaw responded that the FDA permitted the use of rabbit antibodies and that that should be good enough for Krahling. Shaw refused to discuss anything further about the matter. Instead, Shaw talked about the significant bonuses that Emini had promised to pay once the testing was complete. Shortly thereafter, Emini agreed to meet with Krahling. Krahling brought to the meeting actual testing samples and plaque counting sheets to demonstrate to Emini the fraudulent testing that Krah waa directing. Emini agreed that Krah had misrepresented the data. Krahliug also complained about the use of rabbit antibodies to inflate the seroconversion rate. Emini responded that the rabbit antibodies were necessary for Merck to achieve the project's objective. Krahling proposed a scientific solution to lower the pre-positive rate and end the need to falsify data -- stop using rabbit antibodies. When Emini declined, Krahling asked him what scientific rationale justified using the rabbit antibodies. Rraini explained that Merck's choice to use these antibodies was a "business decision." The next morning, Krah arrived early to the lab and packed up and destroyed evidence of the ongoing Protocol 007 efficacy testing. This included garbage bags full of the experimental plates that would have (and should have) been maintained for review until the testing was complete and final. Despite the threats he received from Suter and Emini, Krahling called the FDA to report this activity and Merck's ongoing fraud. Merck completed its Project 007 testing in late summer or early fall 2001. Unsurprisingly, the results Merck reported fell within the 95 percent seroconversion target Merck had from the outset. This is the result Merck provided the FDA and the public at large. What no one knew outside of Merck - not the FDA, the CDC or any other governmental agency -- was that this result was the product of Merck's improper use of rabbit antibodies and the wide-scale falsification of test data to conceal the inflated seroconversion numbers these antibodies generated.